Gustavo the Groom helping prepare the flowers. Do you see why I married him? I see that many people are interested in a do-it-yourself bouquet for their wedding so I wanted to update the information on how I did mine. I chose Grower's Box to order my flowers. It was $200 for 250 roses in four different colors. I got pale pink, ivory, two toned pink and peach, which looked like orange. I'm not going to tell you that it's lickety-split, then you're done. It is a little bit of work, but if you do it right and have some help, I'd highly recommend it! You get the flowers delivered fairly early in the morning two-three days before the wedding. My wedding was on Sunday and we had them delivered on Friday. They have to hydrate in spring water for a day. We kept ours in the plastic wrap so the flowers wouldn't open too quickly. Honestly, they warn you that they will look dehydrated, but mine looked fine except for a few bad ones. This picture is what 250 roses in a bucket looks like. Oh, but be careful! There are flowers just underneath the flowers. When you cut the stems the first time, you may cut them all the same length and not notice that they are tucked under there. We didn't notice because they were still wrapped when we made the first cut. For us it didn't matter because they were still too long. I had a friend who was instrumental and took charge of the whole process. I would not recommend that the BRIDE is that person. There was so much going on the day before that it is too much to do flowers too. I told them what I liked and they basically just did it for me. I could see how it was going to look by bunching them together. Of course a picture would be best. Since I got married in SC and I live in Texas, I had a hard time remembering everything I had to bring. All my wedding pictures got left at home. Grower's Box has instructions on how to care for the flowers and their customer service is wonderful. We had a bunch of vases and picked the flowers to go in each bouquet, then tied them up. Here are the final boxes of flowers minus my bouquet which we put in a cooler. In total, we did four bridesmaids, my bridal bouquet, the throwaway bouquet, 10 bouts, and 8 vases of flowers for the tables. We did them on Saturday afternoon and evening. The truth is we didn't go to bed until 3:00 am! Learn from me, START EARLY! Here is a photo of how they turned out! I loved my bouquet. It was so fragrant and I adored the ivory roses. The reason I decided to do my flowers was purely financial. Obviously it would have been easier to have a florist do them and deliver them. Also, I was content to have very simple bouquets for the wedding. If I had wanted a "designer bouquet", it would have been more costly and difficult. I was quoted $850 for a minimal amount of roses in each bouquet and table flowers. For example, we would have had 6 roses in each bridesmaid, but with greenery too. We used about 12 when we did it with no greenery. I have a feeling that using 250 roses with a florist would have cost me a huge amount of money. The florist quoted me $200 for only my bouquet and that was using 25 roses. Anyway, even if you decide to use a florist there are ways to save. I had considered the bridesmaids only carring a single flower. Everyone I polled thought this was a very elegant way to go. Even when money isn't a consideration, brides are choosing to do this because of the simplicity of the look. You can use a rose, lily, or even a gerbera daisy. 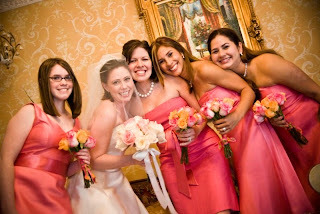 What I struggled with the most when planning the flowers or anything else for the wedding was "What should I do? ", instead of "What do I want to do?". I honestly didn't know what I wanted so I just kept researching and looking through magazines until it hit me. What did I learn? Go with your first instinct. There are no wrong answers. All flowers are beautiful. In my opinion, don't spend thousands of dollars on them. Literally, you hold your bouquet for a few moments and that's it. Another piece of advice, don't let people "should" on you and don't "should" on yourself. Again, there are no wrong answers. I got stressed over many details and wanted others to tell me that I made the right choice. If you need that too, I'm telling you that if it is what you think is pretty, then you are making the right choice. There will not be anyone judging the final show! Other materials that you need: flower tape, floral wire, wire cutters, vases, spring water, and satin ribbon to wrap the bouquets. **Please email me if you would like me to write about other aspects of wedding planning. My name is Andrew Greene and I co-founded The Grower's Box (www.growersbox.com) with my brother. We both love your write-up of working with our flowers - and are thrilled you had such a positive experience! We're very interested in sharing your story on our website - and would be very appreciative if you would allow us to do so. You can see some examples of this at www.growersbox.com/blog. We really appreciate your business and your sharing your experience with others. You can always reach out to me at any of the below. Thanks again. I am making my own bouquets and I just ordered my flowers from www.bunchesdirect.com. They allow you to order in small quantities (as few as 10 stems of some varieties) so I was able to get about 10 different types of flowers. I got 385 stems for only $300! My bouquet will be purples and creams with roses, alstroemeria, carnations, dendrobium orchids, daisies and lisianthus. Thanks for the tutorial- I can't wait to create my own wedding arrangements! My wedding is Sunday, May 22 and I am having the flowers delivered on Friday, so I will let you know how it goes! So many beautiful roses! Inspiration and crafty hands can work miracles! Thank you for sharing! Great article on wedding flowers, it was a pleasure to read this post. Thank you for sharing!